As a favor to Cocteau, Brynner did a guest bit in LE TESTAMENT D'ORPHEE, a movie that was a tribute to the French surrealist author. 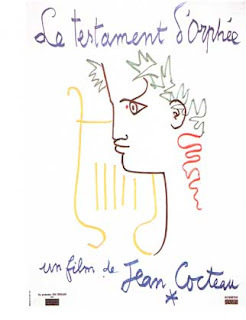 It was written by Cocteau, directed by Cocteau, and had Cocteau playing Cocteau. Brynner claimed that he had helped fashion the perplexing story line: Cocteau's spiritual search for himself in a world full of phantoms and symbols. Yul's part was that of a tuxedo-wearing gateman who guards the entrance to hell. His assistants were also clad in tuxedos and had completely bald heads. Other cast members were artist Pablo Picasso, bullfighter Luis Cominguin, writer Francoise Sagan. "Jean was very interested in hell," Yul said. "So am I. We purposely chose Les Baux-de-Provence for the setting of trhe movie because Dante had lived there when he wrote the INFERNO. It gave you an eerie feeling of the devil at work. One of the many troubles with Hollywood studios today is that they allow accountants to choose the area where the film is to be made. Damn little thought is given to the historical significance!" Brynner attended a special Hollywood screening of LE TESTAMENT D'ORPHEE. Midway through the film the audience, composed largely of high-ranking motion picture executives, started booing and hissing. Yul ordered the projectionist to cease running it. Then he hopped on the stage and shouted, "Cocteau was right when he told me that this movie should be forbidden to imbeciles!" This diatribe didn't prevent him from being hired by MGM for SOLOMON AND SHEBA (1959). As bad as many of his films were, none rivaled this big-budget flop. It is well up on lists of the worst movies ever made. Yul's friend Tyrone Power had originally been selected for the leading role. When Power suffered a fatal heart attack, Brynner agreed to substitute. Because he arrived on the set after the film was in production he didn't have sufficient time to learn his lines. The result was that he often looked as if he were reading them from cue cards - as he was. "But it really didn't matter," he said. "Even by Hollywood standards the script was ludicrous."